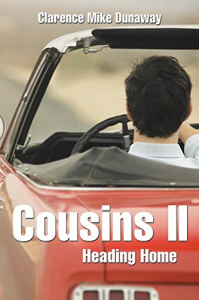 EL CAJON, CA, UNITED STATES, August 8, 2018 /EINPresswire.com/ — Following the success of the publication of Cousins, the first of its Trilogy, Clarence Mike Dunaway releases the sequel, Cousins II, a book that offers twist and turns that will defy a reader’s definition of the word mystery. Cousins II highlights Connor’s continuous attempts of finding Rebecca. After being deserted during their senior year, Connor’s life has been dented and his futile search commenced. During his journey, he meets a woman that helps him in his endless search for Rebecca. Their journey began and after a year and two months, a secret is divulged. The woman finds Rebecca but continues to hide it from Connor with the hope of getting Connor to reciprocate her feelings towards him. But fate leads Connor back to Rebecca and he discovers that she is married and is living in Georgia. It was time for him to accept the truth and return to his ex-wife. The question lies whether Connor’s ex-wife will take him back, now that Rebecca is finally out of his life. The mystery of the story goes on for the readers as together with the characters, they will be boggled and will continue to look for the answers. Clarence Mike Dunaway was born in California in 1930 during the great depression and grew up there. He was bored while in he’s late seventy’s and decided to write, and so he did.